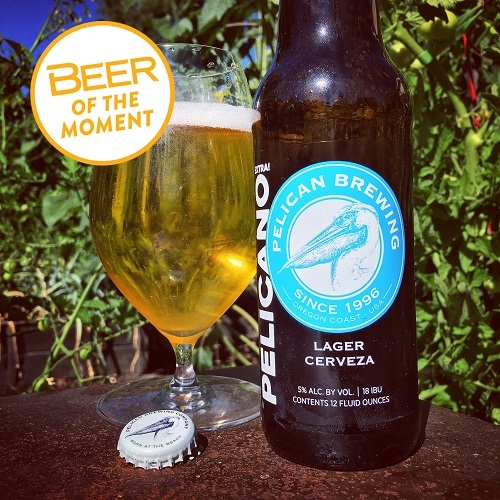 Beer of the Moment: Pelicano Extra! Pelican’s Pelicano Extra! arrived at our Northern California office while we were finishing up the September issue of All About Beer Magazine, which includes (among a myriad of other things) a roundup of Mexican-style lagers. While Pelican’s release came shortly after our deadline, it ended up being among the best of the bunch sampled. This one’s said to be “inspired by the lagers of Latin America,” and certainly fits with the general mold of what we’ve been seeing from such beers. An addition of flaked corn beyond the core six-row malt helps to lighten the beer’s body, while Tettnanger hops serve as its key bittering baseline. The thought of drinking this along the beach at Pelican’s original place in Pacific City is pretty compelling. Of those dozen-plus promising examples of this style we’d recently sourced for our next issue’s Trending column, the easiest way to go awry is by messing with the feel. These should be hugely drinkable, and the most intriguing takes made subtle tweaks to fit with that lean framework. Pelicano Extra! pours bright and clear, in-between straw and golden. Notes of toasty pils malt, white pepper and sourdough exert aromatic pull, while the crisp bite of CO2 and an added hint of white grapes land from the outset. The core maltiness of toast and honey is met with a touch of almond and yeasty breadiness—a bit amped up in body over others, but with vibrant bubbles, lean mouthfeel, and a dry finish steering well. Pelicano Extra! landed this month, and will be available in select spots through September in six-packs and kegs. Pelican recently released a variety of summer options in addition to their returning Pelicano Extra!, including Queen of Hearts (a saison-style ale aged in Old Tom gin barrels) as well as their newly introduced Sun Flare (a dry-hopped pale ale using El Dorado, Meridian and Santiam hops) and Citricumulus (a Belgian-style pale ale with orange peel). Full results of that Mexican-style-lager roundup will be in our September issue of All About Beer.